So apparently there’s this blog hopping idea going around–a writer invites you to discuss your work in progress on their blog, and you in turn invite a few others and host them on your blog to talk about their works in progress. So, any takers who would like to discuss their current works and be hosted by me? Comment with your email address and I’ll send you the details and the questions. I caught at least part of the second episode of “Revolution” last night, and for some reason, I was underwhelmed. I guess after some of the blockbusters of dystopian worlds like Hunger Games or even The Stand, I wanted a little more of the actual disaster and less personal drama. The show is already starting to remind me of “Lost” which lost my attention after the second season. Ah well–and the previews looked so promising! For me, there’s just something appealing in the dystopian novel about watching how people react when their world comes to an end. I know there’s a trend right now in looking at societies several years after calamity, such as in Hunger Games, and certainly there’s an appeal there as well. Perhaps most people don’t want to face the reality that everything we know, everything we trust could come to a screeching halt with just one cataclysmic event. The new society that forms after the event assuages us that no matter what happens, humans manage to survive and create a new system. Perhaps we need that reassurance. One thing I do find interesting in this day where we are dreaming up all these apocalyptic scenarios is that this end of the world thinking is taking place at when electronic publishing is blossoming. So many new stories, new books, new dreams. “Noon”: When Ed loses his shadow, will voodoo save the day? Or will he meet his death when the clock strikes noon . . .
“On Parole” It’s 2054 and Randal Krevitz wants a family. The only problem is his partying past. He must pass inspection with the local Department of Family Planning, or remain ‘on parole’ forever. Tentative date available: October 2 on Amazon, Barns and Noble, and Smashwords. I keep reading different articles from different writers on the subject of ebook pricing, particularly for the newer, relatively unknown writer. One camp with voices like Dean Wesley Smith and J.A. Marlow advocates a higher priced book, depending on length. 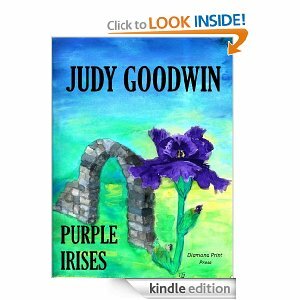 For 80,000 words or more, they say about $6.99 or $7.99. Then of course there is J. Konrath and all his $0.99 books. I also repeatedly see new writers beating the drum and saying in a loud voice that in order to gain readers they need to price low to draw them in. Yet one has to wonder what the reader thinks. Does a reader look at that $0.99 price tag and immediately think of the bargain bin with the all time worst movies of all time? What kind of an expectation does $0.99 set up, as opposed to $7.99? When I shop in my Kindle or on Amazon, that $0.99 immediately screams indie author (and probably a new, untried indie author). It makes me wonder about the quality of the writing and whether I’ll enjoy the book. That being said, this doesn’t guarantee that a $7.99 book is going to be fantastic. But it looks more professional. The writer either has a publishing house who values their writing, or the writer values their own writing and has the confidence to ask for a higher price. Confidence in the writer breeds confidence in the reader. Now naturally it had better be a great product, with a great story, great cover, and well edited. I imagine that the consumer who spends $7.99 for a book full of grammar mistakes is going to leave a nasty review, probably far more often than someone who drops $0.99 on it and doesn’t have high expectations to begin with. So again, quality product = higher price. To all other writers out there, please, PLEASE get as much feedback as you can on your fledgling novel. Get it from strangers who aren’t going to baby you. Know your tools–grammar, punctuation, spelling, writing conventions. Be professional. Otherwise you may be stuck in bargain basement land. Everyone has a secret vice. Mine happens to be disaster movies; I eat them up eagerly, from asteroids hitting the earth to volcanoes in Los Angeles. I love stories that throw our modern world into chaos and force people to get back to the basis of survival. I’ve found there is a whole new bunch of these kinds of stories out there in indie publishing, called the ‘dystopian’ genre. From economic collapse to the Electro Magnetic Pulse (EMP) stories, There are a fair number of these stories which seem to be particularly tied to Preppers, those preparing for imminent disaster. 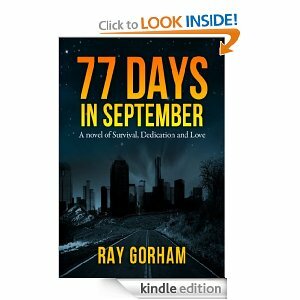 77 Days in September is one such novel, but I found it also appealed to a more general audience. It has a classic disaster movie type of beginning–the protagonist is on board a flight out of Dallas to return to Montana where his family lives. Terrorists shoot off a nuclear warhead high in the atmosphere over the U.S., sending out an electromagnetic wave that fries everything electrical, from cars to cell phones. The plane crashes, but our hero survives. The rest of the story is his struggle to return to his family. I could see some areas where the writing could have been a little stronger, but overall, this was a very good first novel, and I enjoyed it. The characters are believable and likeable, and Kyle’s struggles are real. There was a moment or two where I wanted to shout at Kyle or his wife, “They’re bad! Don’t trust ’em!” But that’s part of the fun of these types of stories. The length of the novel was just right for me, and the suspense held right up until the end, which was very good. Please if you are considering self-publishing, or if you are interested in taking the traditional route in going through a publishing house, you NEED to write what she has to say about scams that are out there and how not understanding contracts and terms and conditions can hurt you. Good stuff! Only a few more hours for my freebie Friday day at Amazon! She was a Lightseer, touched by the gods, raised from childhood to receive and translate dreams. Why then, did she have no answers for the Thane’s illness? her skill as Lightseer to succeed. I would love a review or two! Thanks!